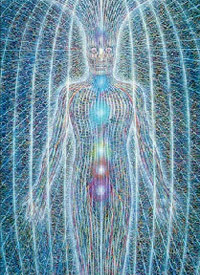 Our second level is the “Energy body” or “electromagnetic” level. EEG, EKG and EMG are some of the common tests you may be familiar that measure the electromagnetic energies in the body. One of my favorite tools I use is called , Heart Rate Variability (HRV). HRV is a simple 6 minute test that gives us a window into the patient’s Autonomic Nervous System (ANS). The ANS is responsible for every function in your body from blood pressure regulation to digestion and heart beat to immune response. When I measure a person’s HRV it gives me a good indication of where that patient is on the health continuum. Here is a 6 minute video I found which gives a simple but thorough explanation. Heart Rate Variability Health is a relative term. Some patient’s tell me they are “healthy,” yet, they are on meds for heart burn, blood pressure and insomnia. A truly healthy person does not need to take medications to regulate these functions. HRV shows a graph of what a physically fit and optimal ANS looks like. In my 8 years of doing HRV, I have only seen two patients who registered at this level. The other insight I glean from this scan is the patient’s emotional health. We view this through a set of numbers known as the SDNN. When the SDNN numbers are low, we must look deeper into the patient’s emotional history. Just yesterday, a 47 year young woman came in with symptoms of depression, weight gain, fatigue and chronic gut issues. As soon as we did her HRV (more info at Emotion Regulation Lab) I asked her about what was going on in her life. Her eyes immediately filled with tears as she talked about her families struggles with job loss, financial stress, her dad’s passing and her youngest son was just brought to the emergency room for appendicitis. As soon as she was able to speak about it, there was a change in the room and in how she was breathing. We have a long way to go, but using a 5 level model will allow us to create a care plan that goes way beyond supplements and detoxification. This patient needs help navigating these emotional waters. We have the tools to do that and we have many supportive resources to offer her. Healing at this level takes a lot of commitment on the patient’s part. It’s simple; but it’s not always easy. This entry was posted in blog and tagged 5 Levels of Health & Healing, Dietrich Klinghardt, Functional Medicine, Heart Rate Variability, PEMF Pulsed electromagnetic field therapy, Quantum Health, raindrop therapy. Bookmark the permalink. ← What are the 5 levels of health & healing?